If you are an NJS member and are participating in a workshop, please let NJS know so we can add your event to the NJS Events list. Pictures are welcome as well. Participate in the NJS YouTube Channel! We're hoping you'll all participate in making the NJS YouTube Channel a great source of info for all levels of jewelery making expertise! If you have any videos, please contact us and we will add your video to the channel as well as the "featured" section. We'll have an area for both artist demos and artist showcases. Let us know if you have any suggestions. This is your channel! 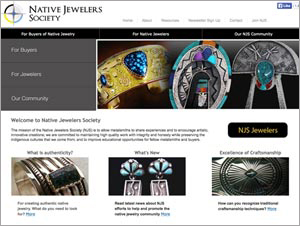 If you want to place an ad on your website, contact info@nativejewelerssociety.com and Suki will send you banner ads. QR codes are a specific type of 2D barcode. In this case we have created a QR code that can be used to access the NJS website. For example, users can have the camera on their phones scan a QR code from a print ad, a business card, or a computer screen. Once scanned, the scanner software on the phone will read the data and open the website address embedded in the code. NJS Banner Ads (View Now) - These are animated gifs so viewable on all iOs devised (Iphone, ipad)- These ad banners are available for those web publishers willing to place ad banner on their website and have it link to the NJS website.